As an official archival portal maintained by the Canadian Council of Archives, this website comprises data from over 800 repositories across Canada in order to provide access to “Canada’s collective memory”. Launched in 2001, this partnership is an effort by several organizations to provide a gateway where the partner institutions can link their holdings (such as documentary records, maps, photographs, sound recordings, videos and more), produce catalogue descriptions of these holdings, and make those descriptions accessible online. Users can access these external repositories and also search the common database by entering simple keywords or by selecting several advanced options. There also some virtual exhibit around Canada’s history on display, enabling access to digitized photographs, maps, and related documents, also gathered under the “site of the day” option. The two most valuable features of this website are a specific link page pointing to a variety of external resources, and the search options, allowing a detailed search through the networked archives. 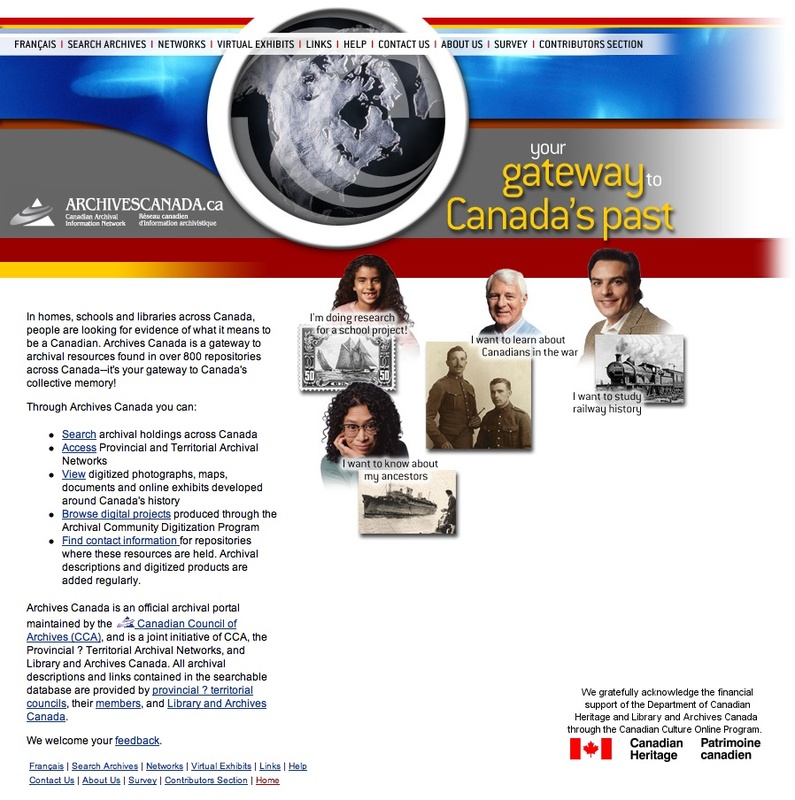 Available both in English and French, Archives Canada is based on a simple design, with the same navigation bar at the left in each page, so that orientation is quite simple. A very comprehensive help section, with many examples and tips for unexperienced users, is also provided.